Reminder: May is Neurofibromatosis Awareness month. NF1 Day is May 17th: Neurofibromatosis Type 1 (NF1) is a condition which develops because of damage to Chromosome 17. 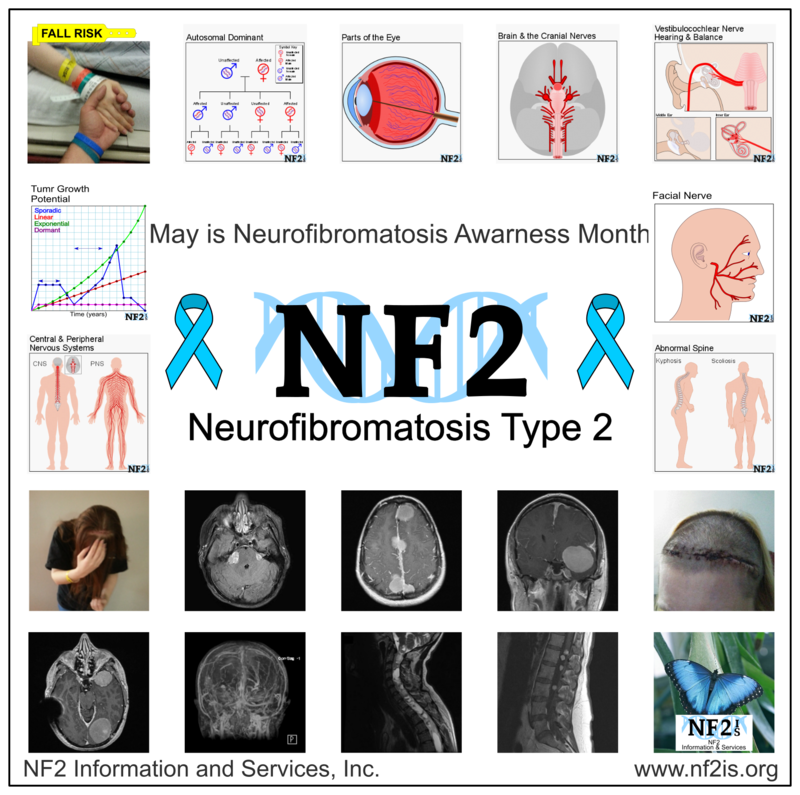 NF2 Day is May 22nd: Neurofibromatosis Type 2 (NF2) is a condition which develops because of damage to Chromosome 22. Some days more than one share was included to cover the multiple NF types better. The date is included on images and facts since what is known as statistics and research has changed understandings of facts over time. Example: NF2 the hallmark tumors were initially called Acoustic Neuroma (AN) when Cranial Nerve 8 (CN8) was known as one nerve. When doctors learned CN8 branched into the Cochlea for hearing and Vestibule for balance, the tumor was officially renamed to Vestibular Schwannoma (VS). Not a change of facts but revision based on science developments. Note: There is a considerable amount of misinformation about the three different NF type from what was understood before genetic testing. Always note dates on sources information about NF; NF1, NF2, SWN/NF3 is obtained from. NF is not one condition, but a series of genetic tumor conditions; NF1, NF2, and SWN; Neurofibromatosis Type 1, Neurofibromatosis Type 2, and Schwannomatosis. 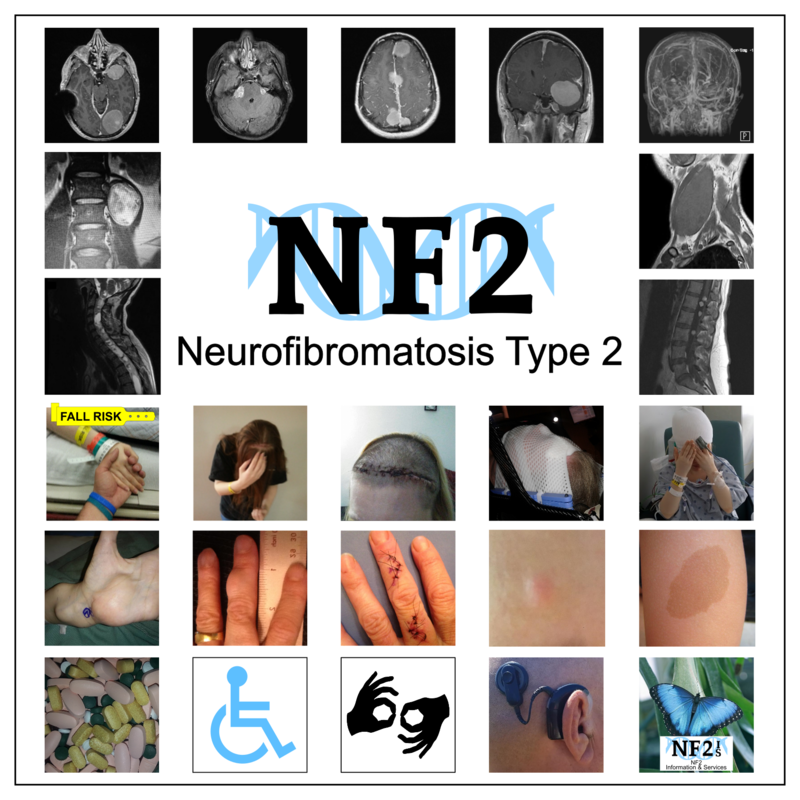 NF1 is the most common of the three (3) types of NF. NF; NF1, NF2, and SWN are not contagious conditions. Diagnosis by medical observation of issues of NF can result in misdiagnosis of NF type(s), doctors now know and can do a genetic test can confirm the diagnosis. NF1 is the results of damage on Chromosome 17. 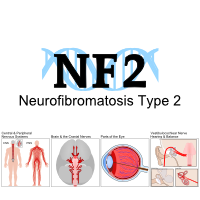 NF2 is the result of damage on Chromosome 22. SWN is the result of damage on Chromosome 22. Early diagnosis of NF and NF type is important to determine what additional tests, selection of possible treatments, and other help. If a parent has a form of NF, the quickest way to determine if their child has NF is genetic testing. If a parent has NF1, their child might also have NF1, not NF2 or SWN. 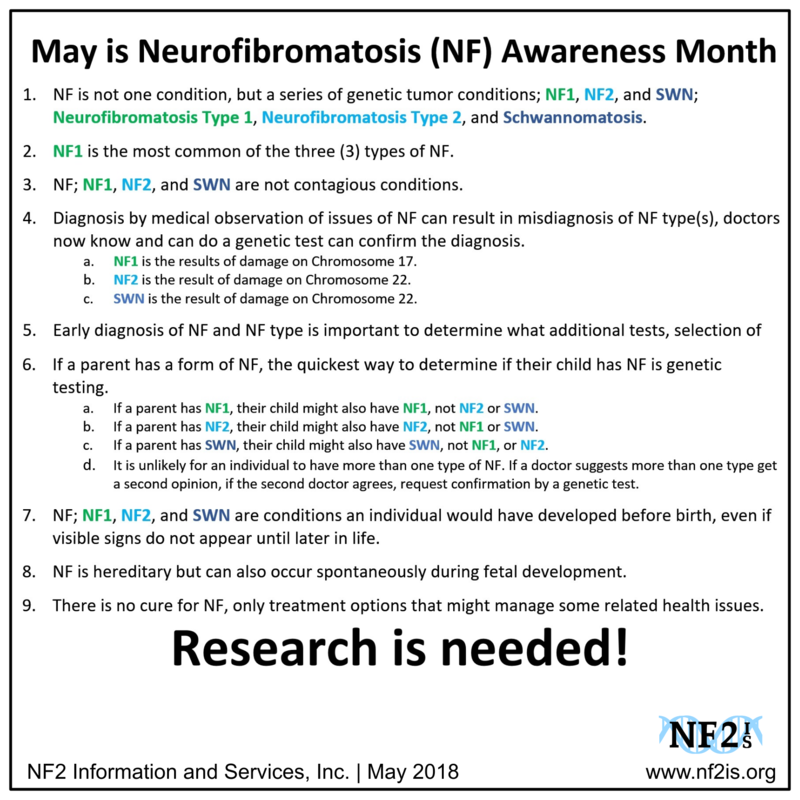 If a parent has NF2, their child might also have NF2, not NF1 or SWN. If a parent has SWN, their child might also have SWN, not NF1, or NF2. It is unlikely for an individual to have more than one type of NF. If a doctor suggests more than one type get a second opinion, if the second doctor agrees, request confirmation by a genetic test. NF; NF1, NF2, and SWN are conditions an individual would have developed before birth, even if visible signs do not appear until later in life. NF is hereditary but can also occur spontaneously during fetal development. There is no cure for NF, only treatment options that might manage some related health issues. National Birth Defects National Month. Auditory Processing Awareness Month. National Coalition of Auditory Processing Disorders. Asthma and Allergy Awareness Month. Better Speech and Hearing Month. National Spinal Cord Injury Month Awareness. Stress Awareness Day. (Nov 1) - first Wednesday of November.